51 people have viewed this property this week. 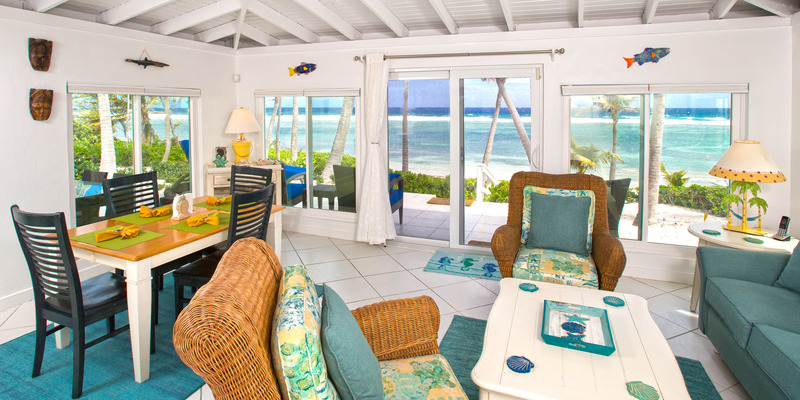 Cool Change is the quintessential Caribbean island getaway cottage. 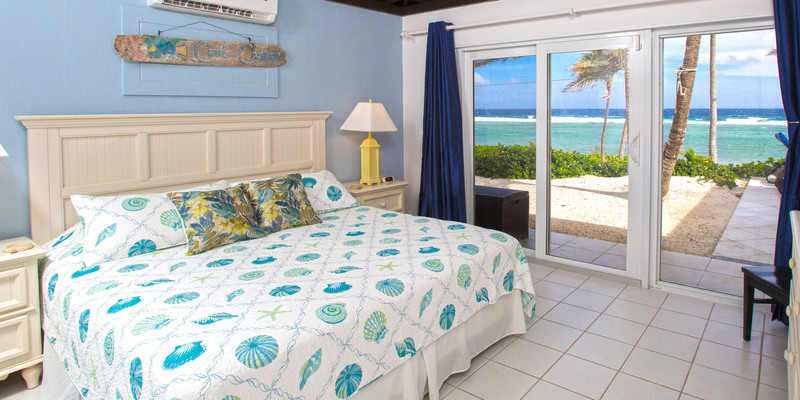 Surrounded by mature palms and casuarina trees on an acre-sized lot, Cool Change offers peace, quiet and privacy, a wide sandy beach, and comfortable accommodations for up to four adults. The beach is very sandy and reef-protected. The snorkeling is excellent and one can walk for quite a while in either direction. There are areas where one can enter the water barefoot here, but we always advise water shoes or swim fins in the marine environment. 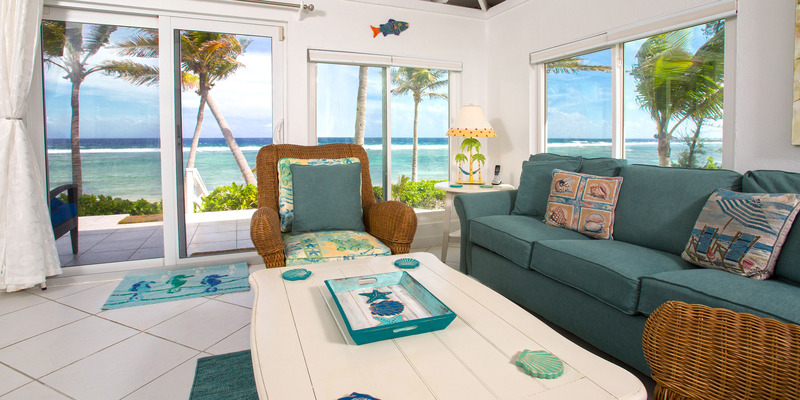 The oceanfront living room has windows on three sides—you’ll practically feel like you’re on the beach! 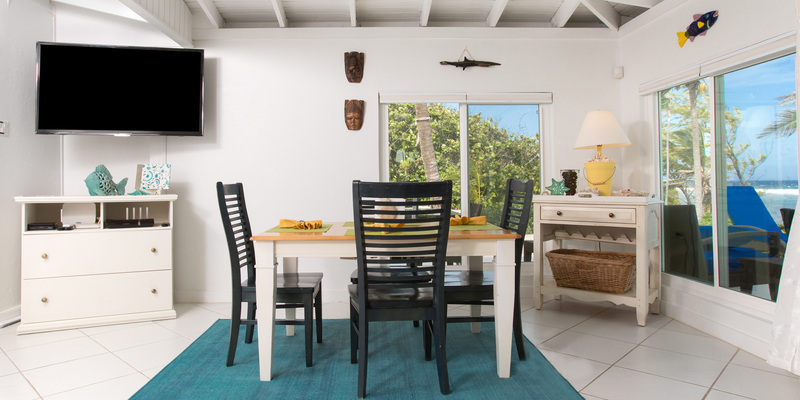 Enjoy comfortable sofas and a large 52" flat screen TV for winding down at the end of the day. Small indoor dining table seats four. Another larger table sits on the patio for al fresco dining! Large private lot, plenty of palm trees for shade and close proximity to the Rum Point Club make Cool Change a favorite for a great value. Sleeps 4 adults max: 1 king bed, 2 twin beds (can be made up as a king upon request) plus two en-suite baths. 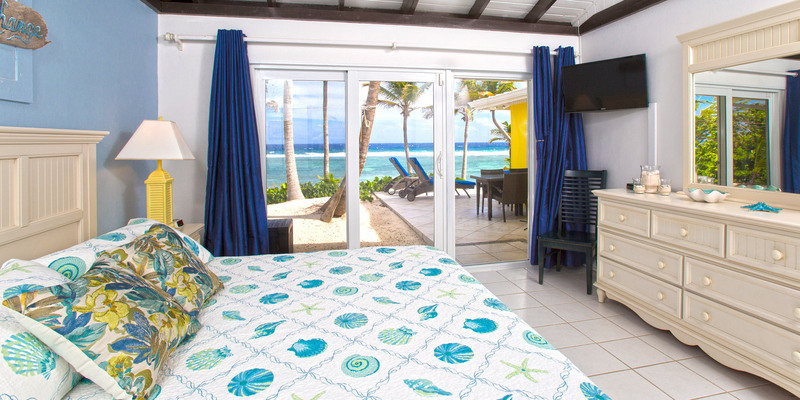 Cool Change is popular with small families and as an intimate honeymoon destination. This cottage is also sometimes rented as an overflow cottage for the nearby larger homes. 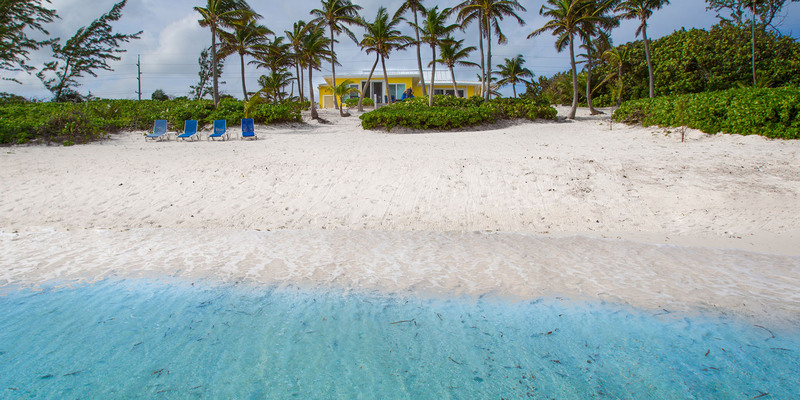 The oceanfront homes in Rum Point offer great reef protected snorkeling. The beaches usually have plenty of white sand, but can also have spots of rocky “ironshore” with natural rock formations. The closer you get to Rum Point, usually the sandier the beach as well as swimming. Either way, with the abundant marine life we have in the water, you will want to wear pool shoes or fins for foot protection. 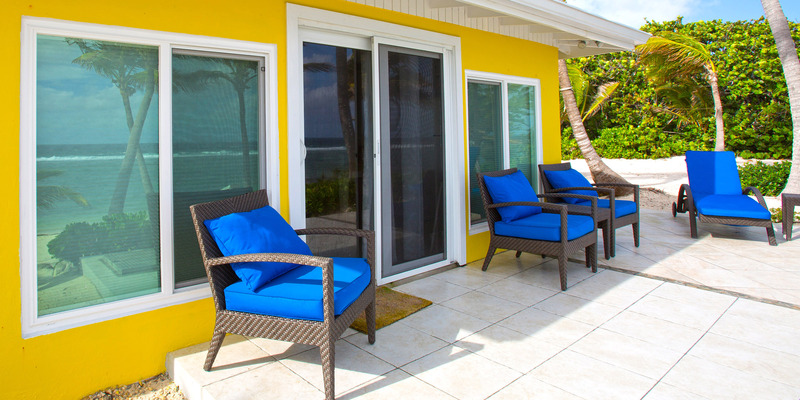 The prevailing trade winds from the east make flying insects less of a nuisance—many of the homes in Rum Point don’t even need a screened porch. Cool change provided our family with a truly relaxing vacation location. The snorkeling was great out near the break water. We preferred Cool Change over any of the \"commercial\" snorkeling locations. It was peaceful and quiet. The cottage was well maintained with all the amenities we needed. Definitely a place we would stay again. The house was just perfect! We loved the area and were so comfortable in the house! Everyone we worked with was so nice and helpful! We’ll be back! Perfect spot to fish, go to sunset at Kaibo, head to lunch at “over the edge” and lay in a private and uninhabited beach in a house the perfect size for 2 then this will do well for you. Thanks for having everything needed at the house including snorkel gear. It was our pleasure to have you at Cool Change. Please come back soon! We just returned from the most amazing time spent at Cool Change. My husband and I settled in comfortably and truly enjoyed our time spent in this lovely little slice of heaven. It was clean, comfortable and well equipped. The AC worked great. A constant ocean breeze allowed us to open the windows during the day. We utilized every single part of the house. The outdoor shower, the washer/dryer, the kitchen, the abundance of beach towels. We cooked every night but one. The one night we ate out we enjoyed the chefs 6-course tasting menu with pairings at Kaibo Upstairs. Amazing! We swam with Stingrays through White Sand sports and will never forget that experience. The beach is beautiful but the seaweed was terrible. Homeowner can’t change this but I think it’s worth noting that it impedes swimming, snorkeling and the view a bit. It was 2 feet thick in most places. Also, would love for them to add a dishwasher and a hammock. With as much as we cooked, it was a bit of a pain to have to hand wash all of our dishes on vacation. Also, there are perfect trees for a hammock! Other than those minor things, our time spent at Cool Change was perfect. We will be back! Almost forgot, Bernie, the property manager was so sweet and helpful. He does a great job with the upkeep of the home. Charming sea cottage with wonderful private porch and beach. Lovely quiet North Side location. The house has a well stocked kitchen and cleaning supply closet. The beds were very comfortable, both outside and inside living spaces were comfortable and accommodating. We loved the beach. Over all quiet and comfortable stay! Love the spot! 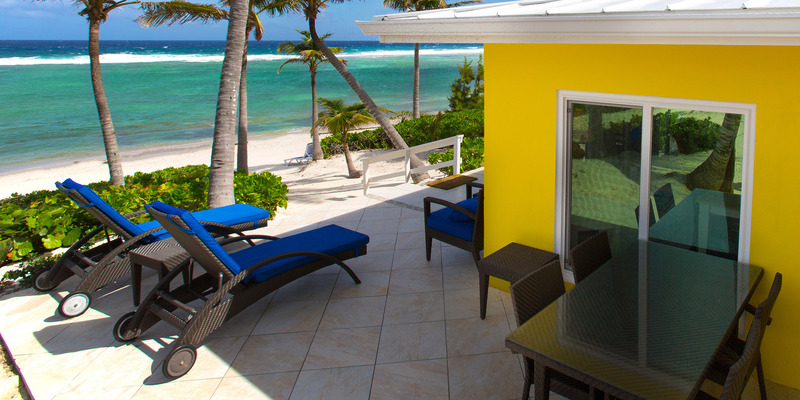 Slightly set back from the beach, this villa has a beautiful view of the beach and water. Well stocked for cooking , including an outdoor grill. Comfortable beds. Clean. Nice living room with plenty of space. Responsive caretaker. Definitely recommend renting a car so you can explore the island. Unfortunately there was a lot of seaweed on the beach while we were there but we walked down the beach a bit to enter the water. Quiet and safe area. The accommodations were perfect! We thoroughly enjoyed our stay and will definitely be returning! There were a few hiccups with the TV and telephone services but did not hinder the good time we had. Ok, there are better houses to rent for 50% more and yes, there is no pool - but for a fine beach holiday with no frills but perfect thrills this is the place. You have to accept the 50/60 minutes drive from the airport and G-Town. You need to be chilled about the lack of shops within 10 miles. But to me that is all good. Iguanas and lizards abound, land crabs and the odd harmless snake make for great spots, and the constant breeze renders aircon unnecessary. Thus is a lovely place where even the presence of foul-smelling sargassum weed two feet deep in the beach and 10 metres out to sea rendering both useless for bathing or swimming should not spoil the holiday. You are close to no one, there is no crime, and the place is well-built and looked after. You can run to Kaibo in 15 minutes or walk in 30 and the road is quiet. A car is essential and you should stock up at Hurleys on day one as it is a long way later to shop. 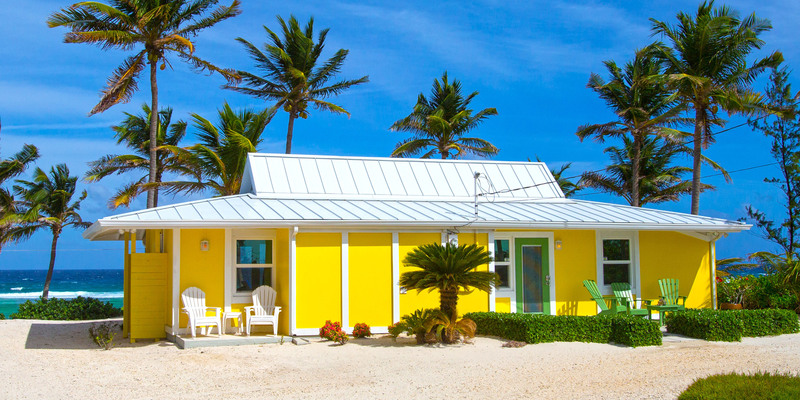 It is not Kansas, Toto, but a beautiful beach cottage, with all the basic needs including Wi-fi - what more do you need? Thank you for your kind words. The sargassum is finally starting to dissipate. Will be gone in 2 weeks. A lovely, relaxing home. We could not have asked for more. After excursions all over the island, we still liked hanging out a Rum Point best! With everything in our lives pre-arranged - it was time for a Cool Change. Kaibo Upstairs is one of our favorite places to dine... ever. At Tukka\'s ask for Omar, he is the BEST! Thank you so much. We hope to visit again. We had a wonderful, relaxing week! LOVED having our own ocean view and a beach. Being able to snorkel from our own backyard was a 1st, Rum Point is a great way to spend the day. Also had a fantastic dinner at Over the Edge! Hope to be back soon! Thank you Cool Change!! Gary and I truly needed a relaxing vacation. Cool Change was perfect. Our mind, body, soul, and spirit has been inspired and refreshed here on the island, staying at Cool Change. This adorable cottage is so pretty and comfortable. The attention to detail is truly appreciated!! We love it here and don\'t want to leave. We had a lot of rain to lull us to sleep at night with the sounds from the metal roof. AWESOME! Best sleep we\'ve had in a long time. The sunny days were beautiful and spent enjoying the luxuries of the island. One night at the Kaibo Upstairs is a must. We both celebrated our 65th birthday this year... and being young never felt so good! Thank you for everything! 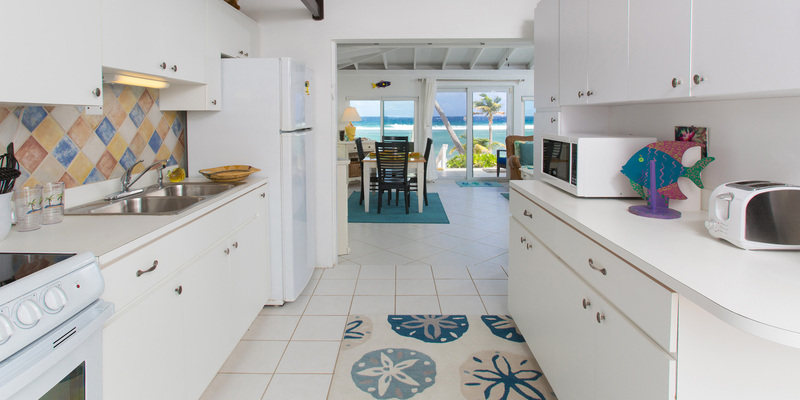 We stayed at Cool Change in preference to a hotel on Seven Mile Beach or a house or condo on the East End or in and around George Town or Bodden Town. It was not a problem to get to great dining opportunities, because the Rum Point Restaurant and Kaibo are 5 minutes away, Tukka and The Lighthouse only 20 minutes. 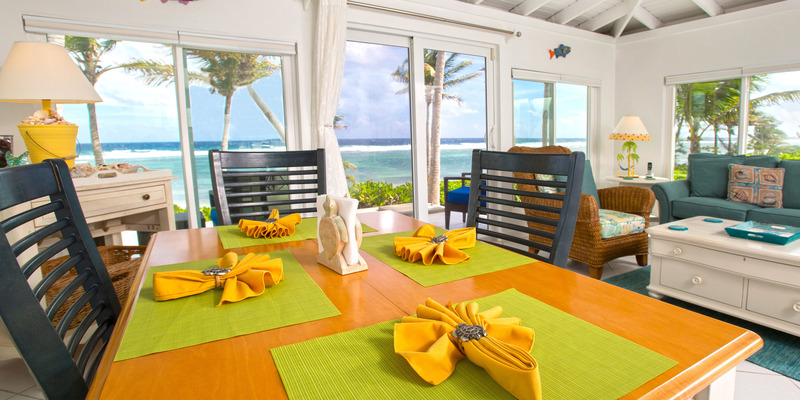 The house is very classic West Indian construction and just the right size for a couple or small family. It has a private beach and even more isolation provided by a vacant lot covered in sea grape on one side and a high hedge of a flowering native shrub on the other. Mornings and afternoons on the back patio are fantastic; we drank our coffee and watched the sun rise each morning. 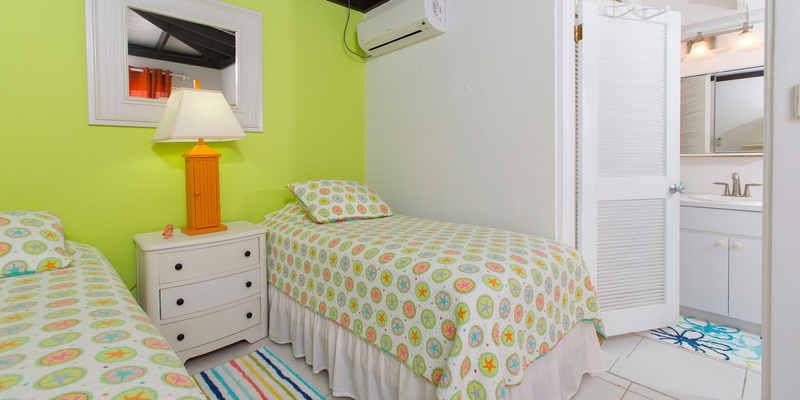 The house stays very comfortable with AC in both bedrooms and the living room, and fans throughout. 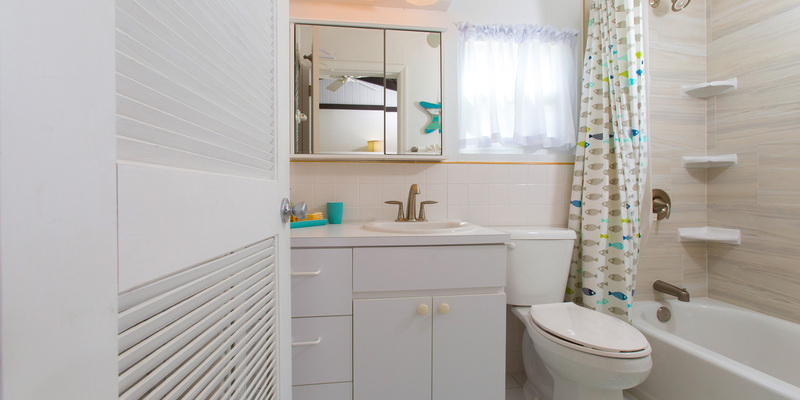 All of the amenities are relatively new, clean and well maintained. We never watched TV, but can vouch for the Wi-Fi. 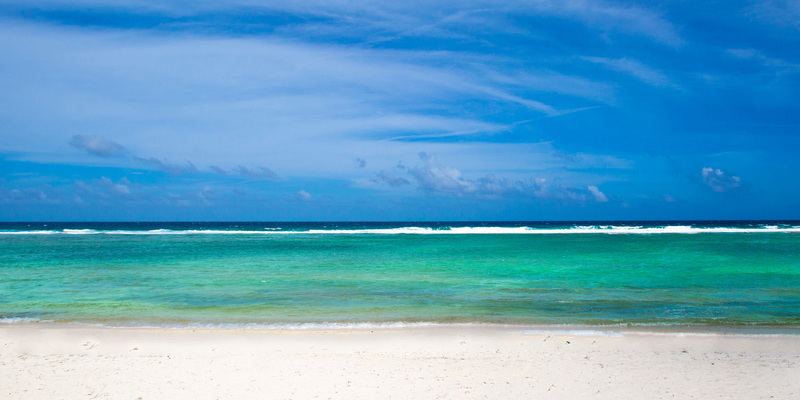 The North Side is the best part of Grand Cayman; uncrowded, serene and yet convenient to anything you would want to do. We will definitely be back! Seeking peace and quiet? This is the place! 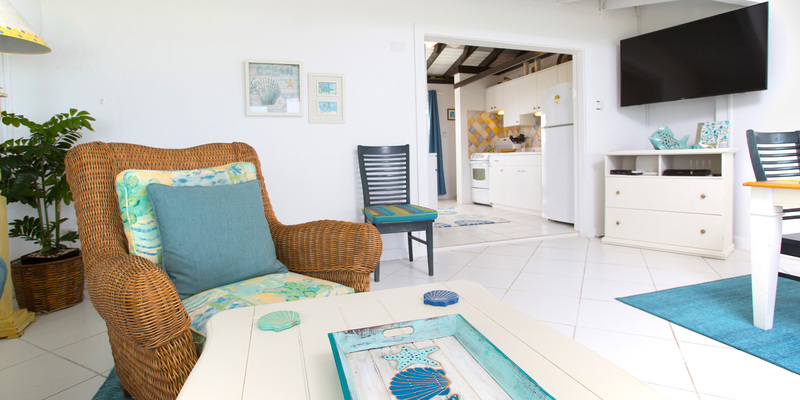 If true relaxation is on your agenda, consider this terrifically charming cottage on the water near Rum Point. 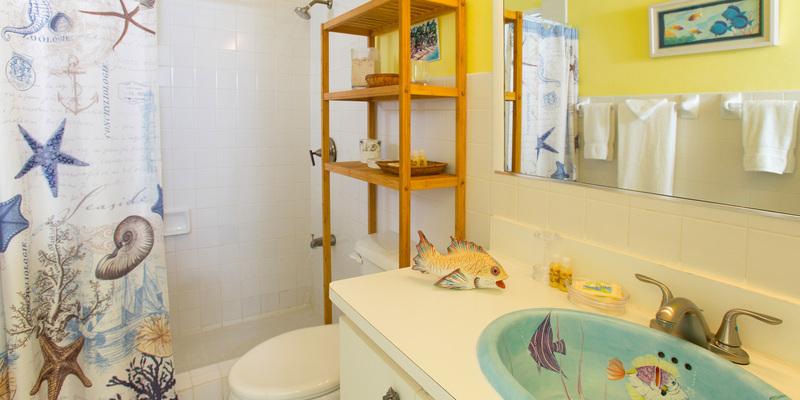 Well appointed condo with all the requisite beachfront touches. 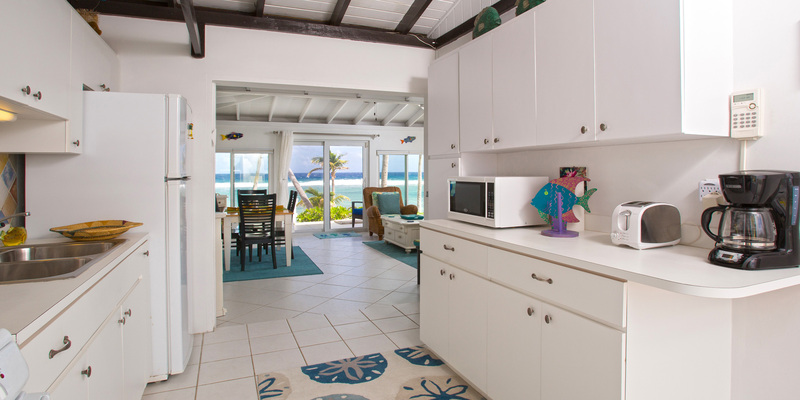 Loved the privacy, the virtually secluded beach, and a location offering elbow room but also near the action of Rum Point. Would happily book this villa again! Cool Change more than met our expectations. It is perfect for two couples as advertised. We found the home immaculate after Angela had cleaned it. The winds were strong when we arrived with much seagrass on beach but was cleaned up that evening. North winds do deposit alot of it on beach but that's life. The home is very private with open lots on either side. Home is stocked with everything needed and is convenient to a number of restaurants and a small grocery store. We enjoyed the snorkeling out by the reef from the house but had much better snorkeling from Scott's recommendation of Queen Elizabeth Monument, just 10 minutes east. Recommendations include adding a fourth beach lounger and installing a shade in twin beds bedroom. Looks like there was one there at some point. Needed to provide privacy and keeping light out in the early morning. Staff was very informative and attentive from original booking of home. 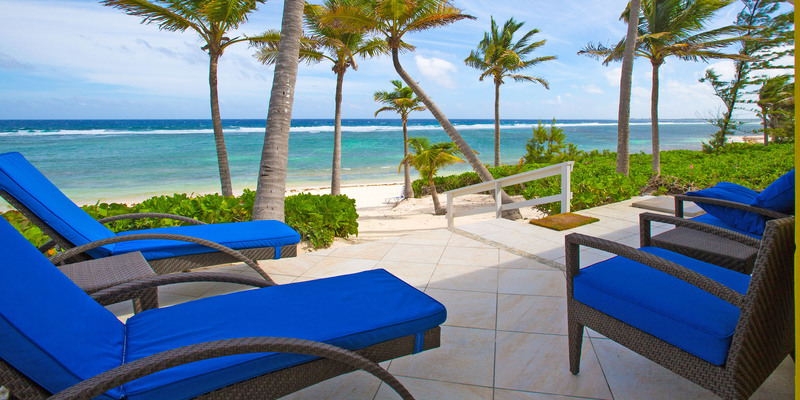 Should we return to Grand Cayman we would very likely utilize Grand Cayman Villas again and if just 4 people, Cool Change. Love "Cool Change" - very private and cozy!! It's the perfect beach house!!!! Small and unpretentious. It has its own beach (walk right out) and the views from the house are magnificent!!! Also, it is not far to Rum point and other great spots to hang out and dine. Love it!! I will be back!!! Can Not Wait to Return!!!! My husband and I stayed at Cool Change from 8/10/16 to 8/20/16. We live at the beach and usually travel to see snow and mountains when we vacation. We have seen many beautiful places, but this one stole my heart! 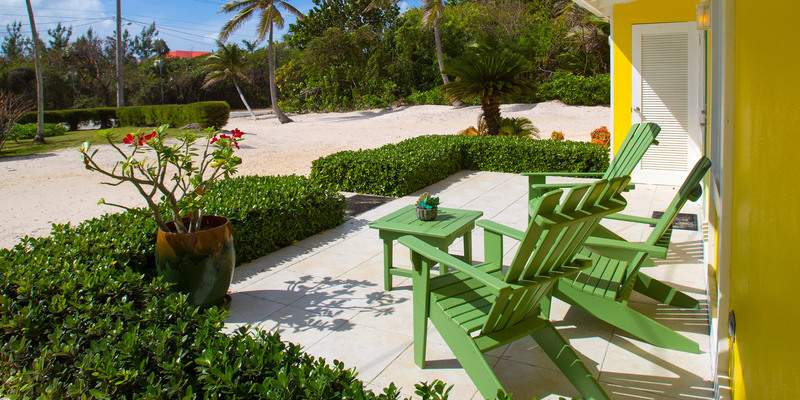 The private beach and landscaping are amazing! We loved the comfy house, outdoor shower, patio and amazing views! I can't say enough about Cool Change! We will absolutely return and bring the rest of our family to share this piece of heaven with! Loved the Rum Point location...so quiet and laid back. There's a great new water taxi (Cayman Ferries: 345-325-7777) that will take you back and forth from Kaibo to Camana Bay for $25 US round trip. Nice boat ride to all the activities and Seven Mile Beach. Stingray City is a must...we swam with Sally the dolphin at Dolphin Cove, snorkeled, went to the botanical gardens...so many firsts! We absolutely can not wait to return! Our group of three (two Biology Professors and a fiancee) stayed here for just four nights and we reveled in every minute of it. The directions to Cool Change were meticulous and we also asked for and were given directions to a grocery store. From the pictures on the website, we could not have imagined the sheer beauty of the villa and its setting right on the sea. 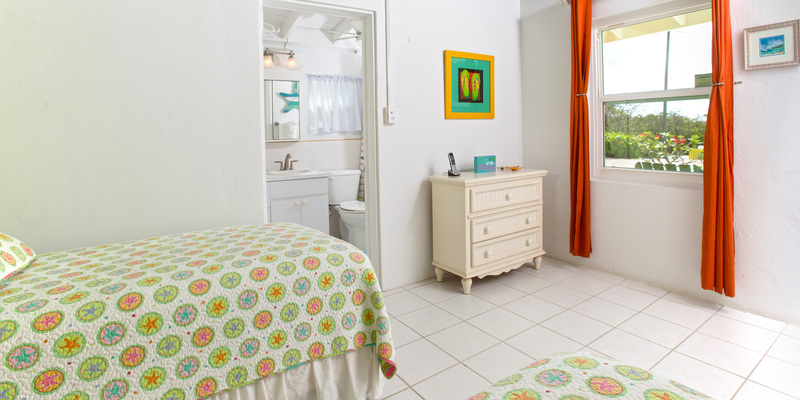 The house was spotlessly clean and well furnished, nothing was lacking throughout our stay. The house sits on what seems to be a large plot of land, the neighboring houses are distant, and the beach (out the back door and down the stairs) is as close to private as you could desire. Large windows and sliding glass doors on the sea side opened out onto a lovely tiled terrace. 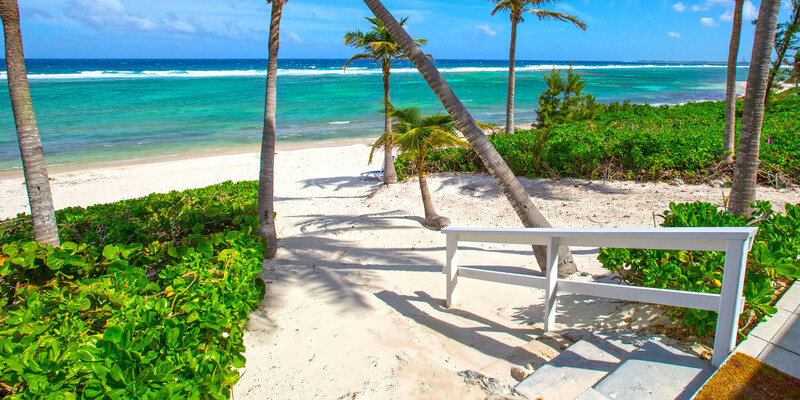 A hammock hangs between two coconut palms and there is an outside shower to rinse off the sea water before entering the house. We had a wonderful time snorkeling and viewing the local fauna, including the small crabs and lizards that appeared on the terrace. We visited several nearby restaurants for dinner and enjoyed good meals at each one. I will look forward to returning to Grand Cayman and Cool Change again someday. Traveling group: Other Would I recommend this vacation rental to my best friend? Yes. Peace and Quiet in This Heavenly Atmosphere! Staying at Cool Change for the third time was just as amazing as the previous two times. We spent two weeks this time and were so sad to leave. We are looking forward to this year and our trip there again. 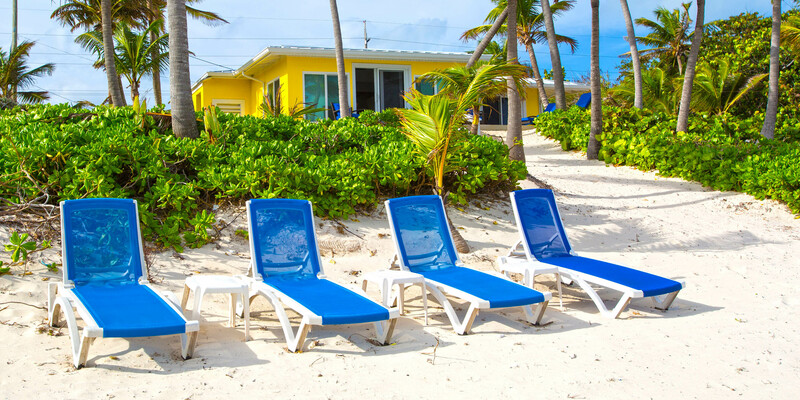 Private, cozy, well decorated and excellently maintained, Cool Change is what Grand Cayman is all about, not commercial or over sized, Cool Change stays in tune with the ocean and its wondrous beauties to behold. 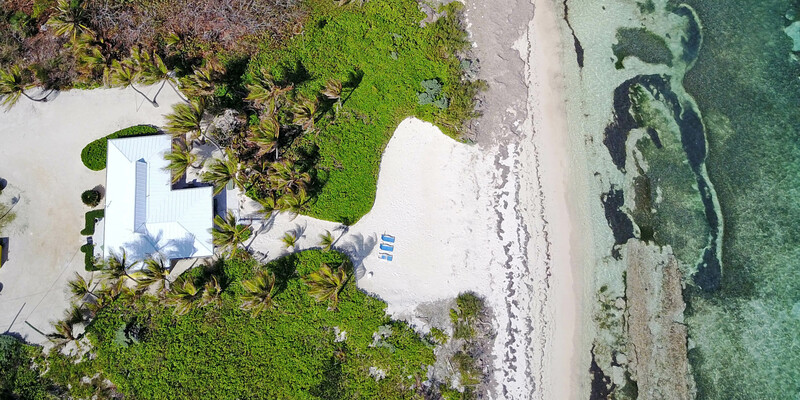 Liked best: The privacy and location on the island Liked least: Nothing Traveling group: Extended Family Would I recommend this vacation rental to my best friend? Yes. Recommended for: Friends getaway People with disabilities Older travelers Families with young children Large groups The property was "as advertised". I recommend the location. The property was a good value for the price paid. The property provided wifi/internet access. My security deposit was returned on time. Beautiful Villa, Island and Fun! Such a lovely Villa! Very private, comfortable and all the amenities of home plus so much more...loved the cute glasses and wine glasses, how much fun!! The owners have done an amazing job decorating their home with an Islandy fell, loved it!! Had luck and shopped at Rum Point and Kaibo. Snorkels right out front of the Villa, lots of things to see, Stingrays, Fish a large variety, Turtles, and so much more We loved it and will return!! 5 of 5 stars Ease of booking5 of 5 stars Directions to the property 5 of 5 stars Key pickup/access to the property 5 of 5 stars Overall condition 5 of 5 stars Quality of bedding/mattresses5 of 5 stars Kitchen/utensils quality 5 of 5 stars Cleanliness of bathroom 5 of 5 stars Quality of facilities/amenities 5 of 5 stars Service Traveling group: Friends Would I recommend this vacation rental to my best friend? Yes. Recommended for: Friends getaway Older travelers, Families with young children The property was \\\"as advertised\\\". I recommend the location. The property was a good value for the price paid. The property provided wifi/internet access. My security deposit was returned on time. 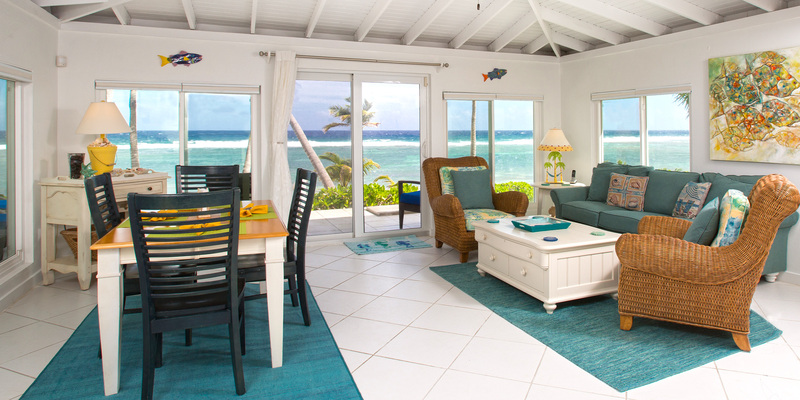 We thoroughly enjoyed our stay at this cozy beach cottage! It was very clean, beautifully decorated and had everything we could possibly need. 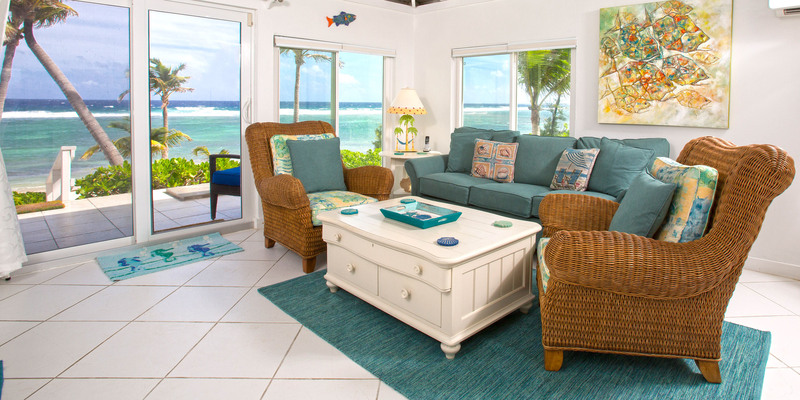 It has a private beach and great snorkeling along with cozy outdoor furniture to relax on. Rum Point and others restaurants are close by to enjoy too! We'll definitely stay the next time we are in Grand Cayman! This is the third time we have stayed at Cool Change and we would never consider staying any place else. It is private, beautiful, peaceful and relaxing away from the hustle and bustle of life. Clean and well maintained the owners are always adding new things to keep this property in tip top condition.